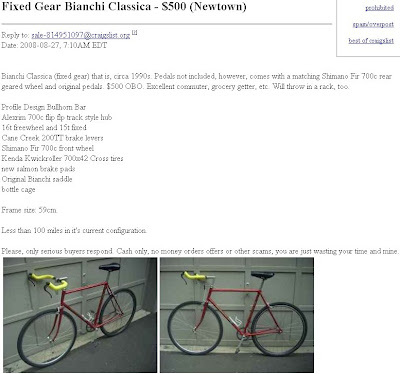 ... it's my Bianchi Classica Fixed Gear on Craigslist. I might even be able to sell this and move onto my next project, another SS/Fixed Gear commuter, which is a larger frame with drop bars. I traded my Magellan Explorist for a Rolf 700c wheelset. It's geared but I have a spacer kit and single Shimano styled cogs that I can use till I get find a good deal on a track wheelset. All I need for this next bike is a new set of tires, tubes, bar tape, new brake cables, and aero brake covers (forget what they are called). It's not a 59 cm, rather 58 cm. The allure of my next MonsterCross project has motivated me into selling this bike and hopefully with the proceeds I will be able to get a decent 29er frame for the build. The other carrot of my motivation is this ad on the Long Island CList: Kona Jake the Snake 59 cm. Man, I want this bike! If I can get between $4 and $5 hundy for the Bianchi I could get it. It won't surfice my MonsterCross needs but I have always wanted this type of bike from Kona. Not sure what the allure is but that bike speaks to me! Sent the seller an email to see if would be willing to meet in Port Jeff. Take the ferry without a bike. Buy it, ride around Port Jeff for a bit and then take the ferry home with the bike. Could be fun.